Can’t get enough of nuts? You might be onto something since a new study shows that eating nuts might be the key to improving cognitive abilities in older people, making it one possible crucial part in fighting against the aging. The study by the University of South Australia focused on more than 4800 Chinese adults aged over 55 and focused on how eating more than 10 grams of nuts per day affects mental health. The result: the high nut consumption was associated with overall better mental functions, improved thinking and even sharper memory. By eating just two teaspoons of nuts every day, the cognitive functions were reported to have improved by up to 60 percent compared to those who didn’t include nuts in their daily dietary habits. We all dream of living forever but the fact is, the aging population is a major public health concern and one of the biggest challenges that researchers are facing. The new study, which happens to be the first to find a clear link between nut intake and mental capabilities, might bring a breakthrough as it refers to how dietary changes could help fight against the health issues that aging population can bring, including dementia. According to the World Health Organization, by 2020 the people over 60 years old will outnumber children under the age of 5. Considering how cognitive abilities might decline around the age above 60, the aging population is no joke. Aging is normal and there is no cure that wards off cognitive decline for good, but this study confirms even more strongly how essential a healthy diet is. By consuming a tiny amount of nuts every day, it can bring stronger cognitive capabilities later in life, thus improving the overall life quality. Researchers also believe that if there’s a way how to help people maintain their cognitive health and independence for longer, the efforts they’re making for the research are completely worth it. No matter if we’re talking about peanuts, cashews, almonds or something else, all nuts can boast with a long list of health benefits, ranging from mental health to heart health. An extensive 2010 study confirmed the health benefits of nuts again, stating that nuts are “nutrient-rich foods with wide-ranging cardiovascular and metabolic benefits”. Until now, nuts have been associated the strongest with heart health, being able to reduce hypertension and of course, fighting cholesterol which is one of the biggest culprits when it comes to heart disease. 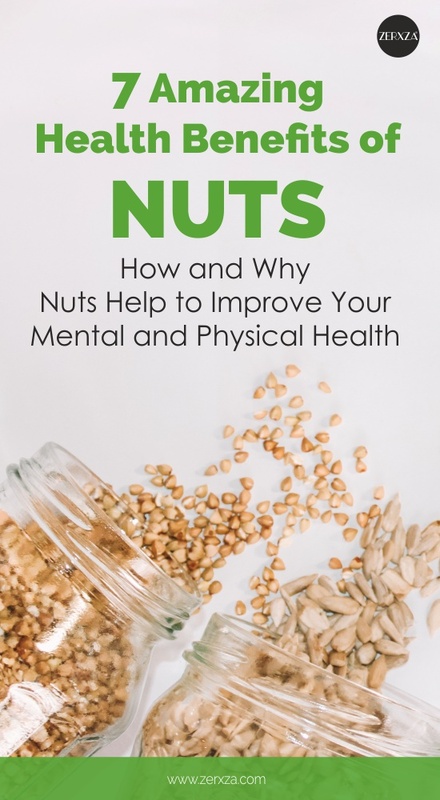 The new study, however, also links nuts with mental health, meaning that just a tablespoon of nuts is all it takes to keep your mind sharp and heart strong! Unsaturated fats. Now, you might think that fats are bad for you, but there’s a huge difference between different types of fats. Unsaturated fats are known to lower cholesterol levels. Instead of eating processed fats, opt for a handful of peanuts to get your healthy dose of unsaturated fats. Fiber. Fiber is like the superhero of our digestive system, keeping our metabolism running right on queue and eliminating unnecessary substances from our body. Beyond that, fiber is also helpful for lowering cholesterol and keeping your blood sugar under control. Omega-3 fatty acids. You might know these from fish, but nuts are actually also rich in omega-3 fatty acids. These healthy fatty acids support your heart’s health and largely help to prevent heart disease. Plant sterols. Sterols, which are naturally present in nuts, are often added to products. Their main perk? Lowering cholesterol! L-arginine. Nuts are also rich in l-arginine which is known to strengthen your artery walls. Thanks to this, you’re less likely to develop blood clots. Beyond these, nuts contain vitamin E, B-vitamins, zinc, iron, magnesium, and various antioxidants, making nuts one of the healthiest foods on the planet! How many nuts can you per day? Nuts sound like the perfect go-to snack – they’re tasty, easy to consume and packed with healthy nutrients. However, even too much of a good thing becomes unhealthy. As nuts are extremely fatty, they’re quite high in calories – 100 grams of cashews, for example, contain a staggering 553 calories and 44 grams of fat! Therefore, nuts should be consumed in moderation and just as a substitute for other fatty foods. To keep your consumption healthy, eat no more than a small handful of nuts – about 1.5 ounces or 2 tablespoons of pure peanut butter. When opting for roasted nuts, avoid nuts that are cooked in oil and select dry-roasted nuts instead. Nuts should be a substitute for other fats, not an extra fat – keep that in mind since nuts can only help your heart’s health if you keep your fat consumption under control. Different kinds of nuts are often compared but is there actually a difference in which nuts you eat to hit that healthy consumption level? Experts say it actually doesn’t matter much. Most nuts contain similar levels of the main nutrients, the only difference is that some nuts contain more than others – for example, walnuts seem to have a higher amount of omega-3 fatty acids and almonds are high in calcium. Just remember to eat nuts as they come – avoid salted nuts or the ones that are coated with sugar or chocolate. Including a couple of tablespoons of peanuts might just be what you need to keep your health in top-notch condition. Previous articleHow Soon Is Too Soon to Get Married? Is the Key to Long-Lasting Marriage the Length of Dating? Next articleWhen “Eau De Toilette” REALLY is Toilet Water… Does Your Perfume Also Contain These Strange Substances? Lesser of the Two Evils: What Does Diet Coke Do to Your Body?